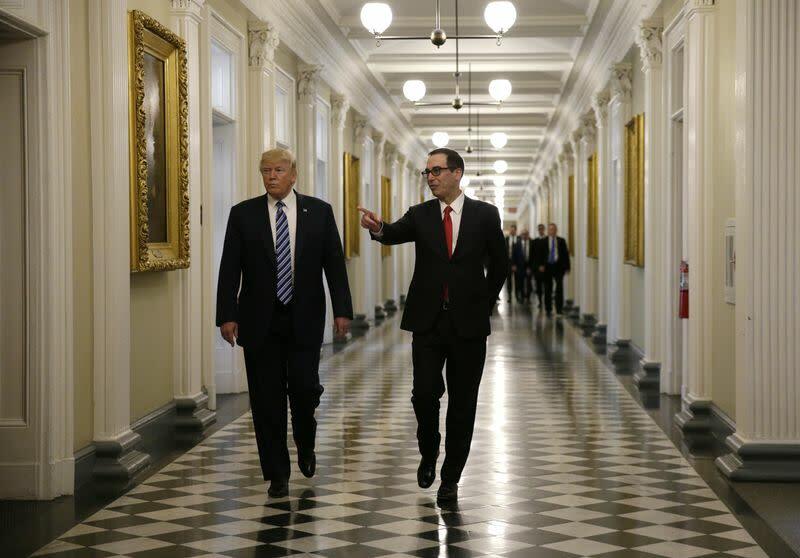 WASHINGTON (Reuters) - U.S. President Donald Trump will order the Treasury on Friday to find and reduce tax burdens and review post-financial crisis reforms that banks and insurance companies have said hinder their ability to do business. A White House official said on Thursday that Trump will issue an executive order directing the Treasury on the tax issues. He will also issue two memoranda asking for reviews of two parts of the 2010 Dodd-Frank Wall Street reform law - the Orderly Liquidation Authority that sets out how big banks can wind down during a crisis and the Financial Stability Oversight Council (FSOC), which is made up of the country's top regulators. The orders, which Trump will sign at the Treasury Department, next door to the White House, comes as the president works toward making good on a major campaign promise to lower taxes. Treasury Secretary Steven Mnuchin will review significant tax regulations issued in 2016 to determine if any impose an undue financial burden on American taxpayers, add undue complexity or exceed statutory authority, the official's statement said. Mnuchin said earlier on Thursday that Treasury is working on tax reform "day and night" and will soon create a sweeping overhaul. Congress recently failed in efforts to make good another Trump campaign promise to reform healthcare. House of Representatives Speaker Paul Ryan said this week that the country's first tax overhaul in decades may not be done until well into 2017. The review that Trump is ordering gives the administration a way to approach the issue independent of Congress. The liquidation authority and the FSOC were both created as part of the Dodd-Frank law intended to prevent a repeat of the 2007-09 financial crisis, when the U.S. government injected billions of dollars in aid into failing banks to keep them from destroying the country's economy. In February Trump ordered a review of the law, saying he wanted to cut out much of it, and Mnuchin has said he would like to look into how the council, which he chairs, works. House Republicans are also working to loosen Dodd-Frank regulations. Banks say the regulations have hurt their liquidity and created burdensome processes. Trump will order an assessment of how the FSOC designates a financial institution as "systemically important," which triggers requirements to hold more capital in case it comes into crisis. Republican lawmakers say the FSOC uses a flawed process lacking transparency to designate non-bank institutions. Only two insurers, American International Group Inc and Prudential Financial Inc, currently carry the label, and a judge last year struck down the council's designation of MetLife Inc.
Mnuchin will have 180 days to report to Trump on the liquidation authority, a tool for federal banking regulators to use if they need to step in during a financial emergency and help a failing bank unwind. The report will offer views on using bankruptcy as an alternative, the impact of failing companies on financial stability, and whether the authority could drive up taxpayer costs or encourage excessive risk-taking.